I am not telling you anything that you don't already know. 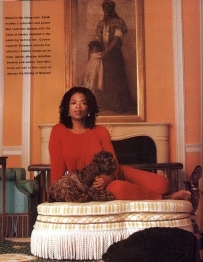 Like her or not, Oprah Winfrey is the number one celebrity. It's not even close. I just want to tell you the reasons why I agree. I used to be among the people that discounted her talk show existence as just so much lightweight entertainment. Like all the others, she had spent the earlier years in pursuit of those things that grabbed the eye and her show had the same loony circus atmosphere as all the others. 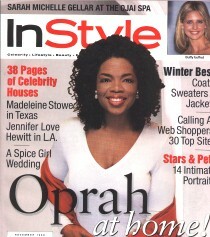 But over the years, I have come to see Oprah as the most genuine person in all of the media. She decided to elevate the quality of that weekday hour her show occupies. I am proud to say, as an African American, as a God fearing human being, and yes, as a man that I am sincerely proud of this woman. She doesn't rap, sing or dance, doesn't dunk basketballs, or score touchdowns. What HAS she done? She has bared her heart and soul, lived her life out in front of us. I am not talking about the acting roles. I mean the personal battles: with weight and her self-image, with love's highs and lows, and with her own personal demons from her upbringing. She has survived, and even better, she has emerged as a supreme role model to every age, race, culture, and to BOTH genders. That's right. Men should be man enough to admit this much. If she isn't one of your very favorite people, she should be. 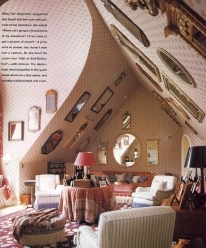 These pictures, except for the one with Steadman, are from the November '98 issue of InStyle, and were taken by Dana Fineman. 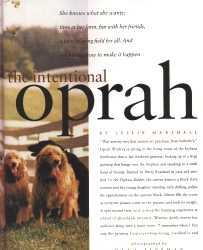 They are of Oprah's farm in Indiana, a "getaway" she shares with her 9 horses and 11 dogs. You really have to read the article, its very good. 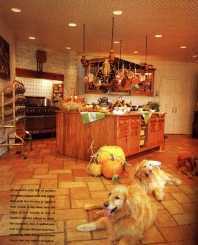 It shows the decor of her place, but also delves into the person. Her show has been nationally syndicated for 13 years. That means many of you grew up with her in the media. She has her own vibe, it comes through in her on-air personality. With her TV and film production company, Harpo, she answers to almost no one. Like many celebrities, she gets tons of mail, and plenty are just begging for money. 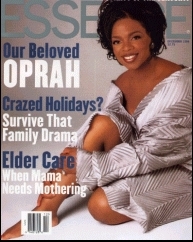 Oprah actually takes these letters to heart, and has weeded out the greedy to help many of the truly needy. Like Bill and Camille Cosby, she does not made a big noise about it, not seeking the glory and especially not wanting to cause a huge increase in solictations. To have withstood all the fat jokes, and the microscope that fame put one under, it's an accomplishment just that she is still here and still sane. I don't know what else to say about her. It's something that just touches your heart. I am a fairly cynical individual, but I get a lift from just watching her show sometimes. It's hard to explain. 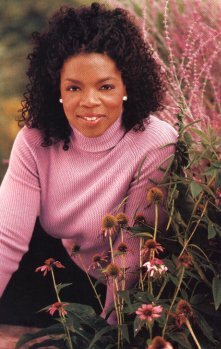 Sometimes, Oprah feels like she is one of my sisters, and other times she says or does something that reminds me of my wife. The warmth she projects is that honest. 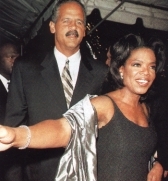 Many men tend to laugh at the idea of being an Oprah watcher. It's not easy letting your guard down. But with all the insanity on TV, the images that seek to shock or titillate you, I really think this show, and this person is a geniunely positive exception. Don't underestimate the power of positive thinking. We have witnessed how it has transformed at least one person before our eyes.